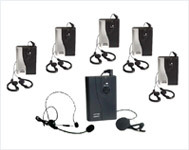 Paging Systems are wireless communication system specially designed for a one-way communication. HT-Vox presents state-of-the-art paging solution that spell efficiency, ease of usage and higher productivity. This user-friendly device helps in sending quick messages and eases down your communication worries where voice calls might not be desired (or possible). The tour guide operator is the friend to every tour guide. Now it is possible to talk to a large group without having to raise the voice and get the message delivered to every person present. Its superb mechanism and design make it easier to handle while causing zero fatigue. It is easy to use and is efficient in every aspect.